The Cleveland Thyagaraja Aradhana is the largest Indian classical music festival outside of India. It was first celebrated in 1978 and has now grown to be a 10-day festival with more than 8,000 attendees with 2,000 appearing for the opening weekend. The year 2010 is the Aradhana's 33rd year. The last day of the Aradhana is dedicated to dance, and the grand finale that brings the festival to a close is the dance competition. Anwesha Das won the first prize in the senior category dance competition and the best performance in the dance festival, among 40 dancers at the recently concluded Cleveland Thyagaraja Aradhana. 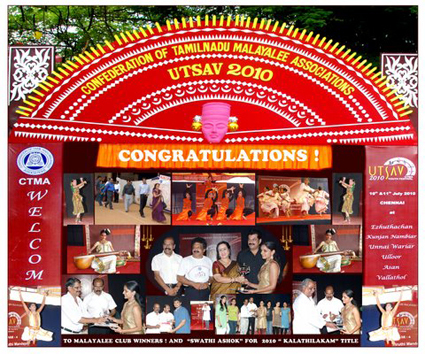 Swathy had participated in the UTSAV 2010 conducted by the Confederation Of Tamilanadu Malayalee Associations in which all the malayalee associations from the state of Tamilnadu participated. Each candidate can take part in 4 individual events & 2 group events. Swathy had participated Bharatnatyam, Mohiniyattam (traditional art form of Kerala), Folk Dance (kurathi) , Fancy dress ( Ravi Varma painting ), Group dance & Margamkali ( traditional art form of malayalee christian community). She won first prize in all the six events she participated. Swathy won the PRAVASI THILAKAM award for securing the highest individual points among all the 650 participants who took part in this event. Swathy received this award from Sri.Mukesh,actor & Chairman of the Kerala Sangeetha Nataka Academy, Smt. Sheela, the legendary malayalam actress & Smt. Kalamandalam Kshemavathy , mohiniyattam exponent.